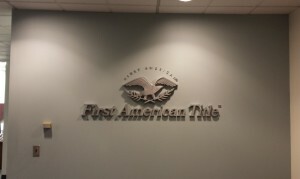 What makes a good wall suite sign? First and foremost, it has to have concise and accurate information. It must be easy to read with sharp looking colors and font. It needs to be eye-catching, but it can’t stick out too much. Then consider the size, the shape, the texture, the material…and the list goes on. As you can see, these small signs can be rather involved. That’s why I highly recommend consulting with a company such as JC Signs in Charlotte, where you can have the best of the best, those who do make these sort of decisions on a daily basis, walk you through what will look best. There are a few basic ingredients to a good wall suite sign, a few things to keep in mind before you meet with a professional. First, you don’t want to use too much color. These signs need to blend into their surroundings so that they are really only noticed when looked for. To take steps towards achieving this, consider using no more than two colors—and I would use, as the primary color, the same shade that is found throughout the building where the sign will be hung. This will help it blend in and adhere to the already established design theme. Secondly, use an easy to read font. Make sure that the lettering cannot be confused or jumbled together—note that you only have a relatively small space for what needs to be said, so make it clear and to the point. Also, make sure your font is not too small. It might be tempting to use tiny lettering so that you can get more on the sign, but this usually leads to a confusing and awkward looking sign. Don’t miss an opportunity to meet with a pro that can guide you towards the perfect wall suite sign. Visit JC Signs today.